Author, A. J. Llewellyn » IT’S TIKI TIME! AUTHOR SPOTLIGHT: LIZBETH HARTZ – WIN A FREE EBOOK! will be appearing this week at the Left Coast Crime Conference in Honolulu, Hawaii. She’ll be on a panel discussing her work so if you are anywhere near sunny Waikiki, come on down and meet her. Lizbeth is also a good sport…she even took time to answer some of my really stupid questions! Don’t forget to post a comment for a chance to win a copy of this amazing book! Hi Lizbeth, what’s your favorite cocktail? I’ll have the cabana boys whip one up for you while I ask you some stupid, I mean important questions. Well, I can’t drink booze – it hurts my tummy, but the closest thing I drink to a cocktail is I do inhale apple brandy through a breathing straw from an oak keg ala Edgar Cayce. Cayce claimed doing this could even cure TB. It did cure my bronchitis, so I’m a believer. I must try that! 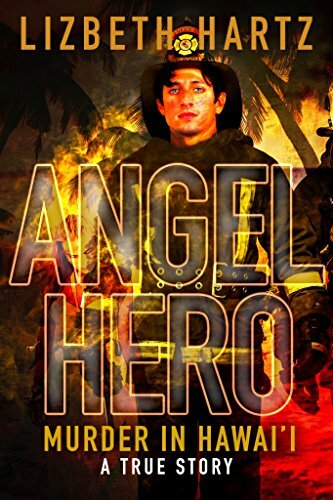 Now, your book Angel Hero deals with a very heroic fireman. There’s a lot of detail about fires in this book which makes me wonder…did you play with matches as a kid? Well, pretty close to it. Once when Mom was away and I was in junior high, I plugged in her heat lamp and tried to get a tan with it. I wasn’t supposed to do that. When I heard her coming home, I quickly shoved it back in its cardboard box and shoved that in her night stand. Trouble was, it was still hot and caught fire, and pretty soon the entire night stand was on fire. Soon the firemen came stomping through the house in their dirty boots and extinguished the fire. Needless to say, I was in hot water for a long time after that! I bet you were! Lemme ask you, what do you think about when you’re alone in your car? I think, why are you alone in your car when you could be out having fun with friends? If you could have an accent in the world, which one would you choose? Brazilian, I think; the same accent the woman had when she sang the bossa nova jazz song The Girl from Ipanima. Oh man, now that song is stuck in my head…which brings me to my last question. You’re stuck on a deserted island after a three hour tour that goes awry. Name six people alive or dead that you’d like to be marooned with…and your fantasy castaway meal. Yikes! You don’t ask easy questions, do you? Well, I’d like to be with my mom, who recently passed away, and my dad, who’s long since been gone. And Vic Lazzarini, the Angel Hero in my book Angel Hero. And Ray Bradbury, my all-time favorite author as a kid. And my favorite living author, Carlos Ruiz Zafon. And the hunk I’d like to play Vic in the movie I hope gets made some day, Chris Hemsworth. As for my fantasy castaway meal, I think I’d like blackened ahi and shrimp chop suey and cheese with plum sauce and green salad with avocado and coconut sorbet. Dazzled by open-hearted Hawai’i firefighter Vic Lazzarini, dispatcher Lizbeth is puzzled by his friendship with Jaku Cardoza, a little man who thinks he’s something big. Liz shakes like a palm frond in the trade winds when Jaku corners her in the alarm room and pummels her with sadistic stories. Gentlemanly Vic couldn’t be more different, and she dreams of romance with this Prince Charming she’s found after too many frogs. Thanks for commenting, Dawn. Yes, it’s interesting, and I can’t wait to read your answers as well, and talk with you on the panel. I had fun coming up with answers to AJ’s silly questions:), so nice of her to include all of us panelists in the fun!